The best-selling Japanese Vita game is heading Westward. Atlus has announced that Persona 4: Golden, the upgraded Vita re-release of the original PS2 RPG, will be reaching North American shores on November 20th. Both the standard version and the fancy "Solid Gold Premium Edition" will be available. The Solid Gold edition includes a Hori face cover and "hard pouch," as well as a protective skin and set of stickers. All the swag is done out in bright yellow and decorated with the game's trademark, Louis Vuitton-esque patterns. Only 10,000 units have been made and they're retailing for $69.99 a pop. Persona 4: Golden (previously, Persona 4: The Golden) started out as a PSP port in the same vein as Persona 3 Portable. 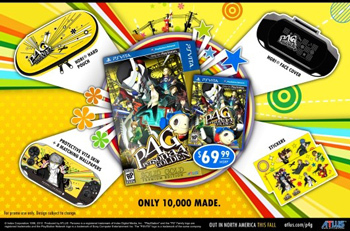 According to series director, Katsura Hashino, he wanted Persona 4: Golden to be a straight upgrade of the original PS2 version, which prompted a switch to the stronger Vita hardware. The fancy new Vita version of the title promises more events, around 1.5 times the amount of voiced dialogue, a bike (excitement!) a new opening movie, more personas and a new character. Unfortunately, unlike Persona 3: Portable, Persona 4: Golden won't add a female version of the main protagonist.